Swedish star Fredrik Lindgren is determined to deliver a rapid response to Tai Woffinden’s FIM Speedway Grand Prix surge when he lines up in the Norrbil Swedish SGP this Saturday. The Orebro-born title contender heads to Hallstavik’s HZ Bygg Arena for the venue’s first-ever SGP event, determined to close the 10-point series lead Great Britain star Woffinden pulled out at the WD-40 Danish SGP last Saturday. Lindgren’s night didn’t go to plan in Denmark after he was excluded for hitting the tapes in his third outing and Woffinden passed him in his final heat race to knock the Swede out of the meeting, before going on to pile up the points in the semis and final. Fast Freddie, who ended the night on seven points, is keen to hit back in his homeland to ensure Woffinden doesn’t pull clear at the top. He said: “Woffy had really good speed and he was riding very well. I was kind of struggling a little bit with myself and the speed in my bike. I couldn’t do anything. “I’m very disappointed with Horsens, but we’ll try and forget about it as quickly as possible and look forward to Hallstavik. Meanwhile, four-time world champion Greg Hancock insisted “I just want to keep the momentum going” as he bids to continue his SGP resurgence in familiar surroundings. 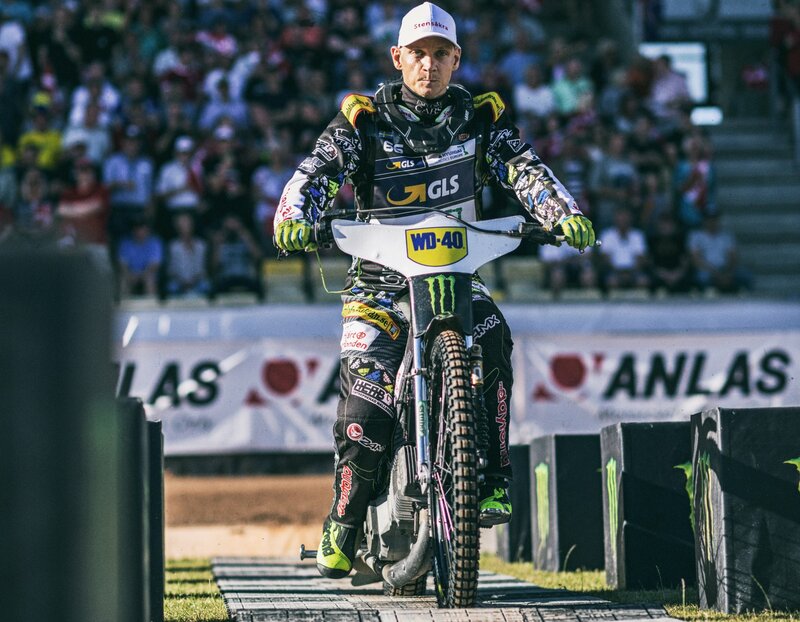 Hancock stormed to third place in the WD-40 Danish SGP, scoring a huge 16 points to leap from ninth to fifth place in the World Championship standings in one night. Hancock is no stranger to Hallstavik, having represented Rospiggarna for 15 seasons in the Swedish Elitserien from 1995 to 2009. While he has been away for nearly a decade now, he can’t wait to head back for the biggest meeting in the HZ Bygg Arena’s history. He said: “I have great memories of my time there. You become a part of the club. My wife is from the same town originally and I still have family there. I feel like I’m a part of that city still, even though I’ve moved on to other places. So many people have helped me out. “I had 15 seasons there. It’s a track I’d like to say I know well, but I haven’t been racing there that much lately – once a year for the last several years. It’s never the same; every track is a little different. With Woffinden 18 points ahead of him in top spot, Grin knows he has plenty of work to do over the next seven rounds to close the gap. He said: “He’s on the gas and we have to be a little bit better not to let him get away. It’s a long season still and he is on fire, but I never give up. Hancock admits he has been testing hard to hit top form. He said: “I have worked on lots of things. We have found small things we had issues with – even last year. We have finally figured them out. I was unhappy with last year too and I knew what it was and fixed it after Prague. Tickets for the Norrbil Swedish SGP on Saturday are still available online via http://bit.ly/2DYcAaV. Sweden and England fans heading to the Norrbil Swedish SGP can warm up for the FIM Speedway Grand Prix action with live coverage of the FIFA World Cup quarter final on the big screen in the Hallstavik fanzone. The match kicks off at 16:00 CET and admission to watch the game is 50 SEK for Norrbil Swedish SGP ticketholders. Tickets are available from the HZ Bygg Arena ticket office. WORLD CHAMPIONSHIP STANDINGS: 1 Tai Woffinden 49, 2 Fredrik Lindgren 39, 3 Emil Sayfutdinov 34, 4 Artem Laguta 33, 5 Greg Hancock 31, 6 Patryk Dudek 30, 7 Maciej Janowski 29, 8 Jason Doyle 26, 9 Chris Holder 24, 10 Bartosz Zmarzlik 23, 11 Nicki Pedersen 22, 12 Matej Zagar 21, 13 Przemyslaw Pawlicki 13, 14 Niels-Kristian Iversen 9, 15 Krzysztof Kasprzak 7, 16 Craig Cook 6, 17 Vaclav Milik 6, 18 Michael Jepsen Jensen 4, 19 Martin Vaculik 3, 20 Maksym Drabik 2, 21 Bartosz Smektala 2, 22 Mikkel Michelsen 1. NORRBIL SWEDISH SGP LINE-UP (in ranking order with rider numbers): 69 Jason Doyle, 692 Patryk Dudek, 108 Tai Woffinden, 71 Maciej Janowski, 95 Bartosz Zmarzlik, 89 Emil Sayfutdinov, 55 Matej Zagar, 66 Fredrik Lindgren, 54 Martin Vaculik, 23 Chris Holder, 45 Greg Hancock, 110 Nicki Pedersen, 59 Przemyslaw Pawlicki, 222 Artem Laguta, 111 Craig Cook, 16 Andreas Jonsson, 17 Oliver Berntzon, 18 Kim Nilsson. This entry was posted in Global News, Moto, Motorsports, Speedway by admin. Bookmark the permalink.